TomH, I don't know if he'd be up for a really minor job like a custom skid plate we are thinking of, but MG Metalworks forum member does some great fab work and runs Expo Vans. Oregon location. Oregon seems to have a wealth of great outfits that could work on our vans. I think I'd be OK with the Aerotank metal tank with extra welded plate on it, but the Sprinter Store spare aux tank for spare tire location is plastic and I'd want a skid plate underneath that. Have you heard any more re. the 14 gal tank? Do you know exactly where it fits and why it is L shaped rather than a rectangular prism? I presume it goes in front of the right rear wheel well, but am puzzled as to whether the entire thing goes outside the frame rail, whether part extends directly beneath the rail, or what. Since I likely need to omit all Aluminess items on the rear, I am thinking of leaving the spare in its original location; this decision eliminates the Sprinter Store aux tank which goes there. Since my sink will be on the passenger side, I am thinking the smallest possible interior fresh water tank beneath the sink and an aux undercarriage water tank beneath it. I wonder whether the 14 gal. aux fuel tank is made of a plastic that is safe to hold fresh water. That location would be perfect for my aux potable water tank. Re. the Aero 20 and 30 gal tanks. Am I assuming correctly that the 30 gal tank will only fit on the 170" WB van, or will it fit also on the 144"? About the only space left is behind the rear wheel wells to each side of the spare. Any suggestions as to how that space can be utilized? Lithium batteries are supposed to go inside, but I wonder whether they could be partially dropped down in an insulated box with the top portion still exposed to the inside? Anyone ever seen one of the drop down storage boxes offset to the side of the space the spare goes? I'd love to store a portable winch there and keep the CoG/CoM as low as possible. 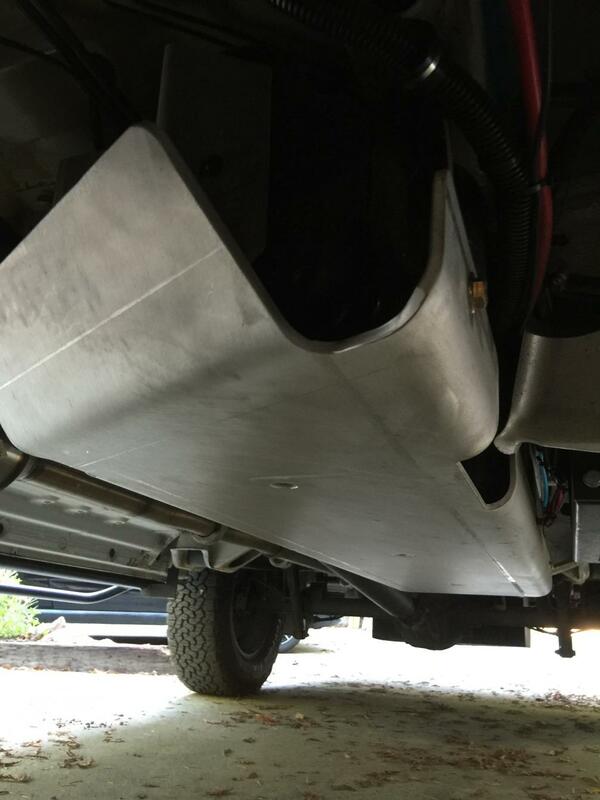 One more question for Fitz: VC put a skid plate under your rear storage box. Since then, they have said they will not do custom skid plates? Is the plate they put there a standard skid plate they make to protect a spare tire that's in its original position, or did they make this custom for you? Keep in mind this is an aluminum tank with a beefy bottom. The OEM tank is plastic. If you're getting in areas that you genuinely feel you'll be impaling either tank or dragging them across rocks, then you'll need to start considering the reduction of break over angle if you add a physical skid plate to the bottom of the aux tank. We'll do a skid plate on the OEM tank, but not on the aux tank. The aux tank isn't critical, can be repaired, and will already have a strong base to it. I prefer to keep the breakover angle and ground clearance intact. I have been busy at work and simply haven't taken the time to follow up with Aero. They haven't (yet) responded to my e-mail with questions. VtSoundman and I have combined forces on this and one of us will make contact and get some answers. I am in agreement with Wrinkledpants above. As I understand it, the tank is constructed of aluminized steel with an aluminum skid plate attached to the bottom. That's another one of those questions awaiting response. As I understand it, the front of the 14 gallon passenger side tank would be under the rear of the front passengers seat and extend back under the slider door opening. I get that from looking at the pictures of the front carriage mounting bolt and the sketch of the tank. Again, another question on the list waiting for an answer. TomH, you asked about differences in the Aero 20 vs. 30. As I understand it, they have the same dimensions with the exception that the 30 is about 2" deeper and thus hangs down lower. You also asked about Van Compass. In my case they built a custom skid plate for my XL storage box, but they did so with the thought that it may very well turn into a future offering in their list of aftermarket parts. There are lots of Sprinters out there with XL storage boxes and protection of them was something they had come across before, thus there may be a need here to develop the product. Consider me being in the right place at the right time to become their beta test site. BTW, I am very happy with how the test is going! I think I am going with the 20 gal aux. I will also call Aero and ask whether the 14 gal. tank would be suitable for use as an aux fresh water tank. I suppose the alloy used in the mixture might be one that will not rust when coated with a film of diesel fuel, but would rust if filled with water. Hopefully, it will be something that does not oxidize and isn't coated with something toxic. If that doesn't work out I will see about having something fabricated for the same location. I still need to figure out if the rear corners can be utilized in any way. Attached at the bottom is a pic of an Aero Tank 20 gal. aux tank snug against the OEM tank. There doesn't seem to be much space between the two. I am worried about there not being enough space left for the mounting arms of the skid plate and the aux tank both to fit there. Here are a couple of other manufacturers' skid plates over the OEM tank. These next 2 pics illustrate how the plates might interfere with the positioning of the aux tank. This second pic seems to show something smaller than a 20 gal aux fuel tank against its side. I can't tell. What are your thoughts about the VC skid plate interfering with placement of the Aero 20 gal aux tank? (I need the aux tank by the OEM and aux water on the other side.) 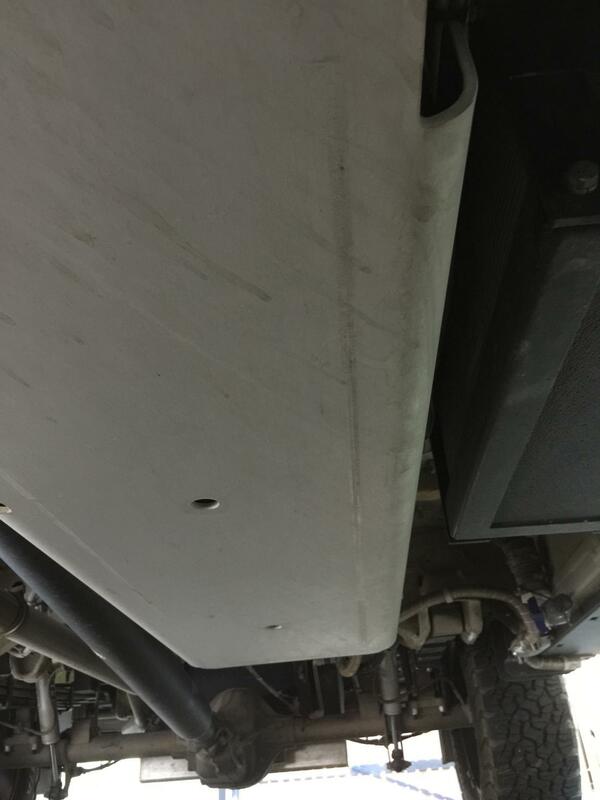 Can you post a pic of your OEM tank and the skid plate covering it? Got your message after it was too dark to take the picture I believe you are looking for. Are you specifically interested in the space where SMB typically installs the house battery to the outside of the OEM fuel tank? If so, do either of these help? In the second picture you can just see the side of the house battery box in its typical location, or in your case, in the location where you want to install the Aero tank. Do you have a width dimension for the Aero tank? It's hard to say if it will fit without dimensions, but as you can see from the pictures I have included the VC skid plate fits up fairly tight against the side of the OEM tank. Edit: I just went out and checked, the VC skid plate sits tight against the side of the OEM fuel tank, thus VC wasted no space with their installation. The added dimension is the thickness of the skid plate and the attachment bolt heads and no more. ps. Note the long stripe down the underside of the skid plate. That tells you why this is such a nice addition when taking the van off the beaten path and into the rocks. I thought I had read somewhere that SMB usually places the on-board propane tank (when customer specs one) to the outside of the OEM diesel tank. Lithium batteries have to go inside due to the fact they become non-functional at about the freezing temp of water, so that space is available and it is where the 20 gal aux tank is designed to fit. I will try to get some specific dimensions from Aero as well as ask whether there is typically any void between the two tanks, also whether they have installed the aux tank beside an OEM with skid plate already in place. If necessary, I could ask for a customized tank that is slightly narrower. Will also ask about replacing OEM with a single larger tank. I had to redo the pic above of the 2 tanks side by side. It should be showing now at the bottom of post 67.